The department of Lot shares it’s name with the river which runs through it. An area of beautiful landscapes that is steeped in history. With so much to see and do in the Lot, one is quite literally spoilt for choice especially in the Lot Valley France. Cahors is a medieval city symbolized by its famous pedestrian bridge, the Pont Valentré, built originally as a fortress in the 1300s. It is a UNESCO World Heritage listed site and forms part of the Santiago Pilgrim route. The Cathedral Saint-Etienne is a national monument, but there are many other buildings from the Middle Ages still standing, including the Saint-Barthelemy Church, the Palais Dueze and the Tower of Pope John XXII. The Arc de Diane is a relic of ancient Roman baths, and the remains of a Roman Amphitheatre were revealed during the construction of an underground car park near Place Gambetta, in the city centre. The Cahors Blues Festival takes place for a week every July. Started in 1982, it is now the longest-running blues festival in France, attracting artists and spectators from all over Europe. It has even received a prestigious ‘Mississippi Blues Trail Marker’ from the state of Mississippi, for its role in promoting blues in Europe. Concerts take place in the Espace de Congrès Clément-Marot, close to the town centre and station. Every Wednesday and Saturday mornings the Cahors Market is held outside the Cathedral, selling local produce from Rocamadour cheese, Perigord walnuts, foie gras, Quercy melons, and of course Cahors wine. 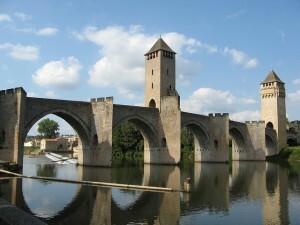 Cahors is known for its wine, which dates back to the Middle Ages. The Cahors wine is a robust and tannic red wine, made from 70% Malbec grape and 30% Merlot or Tannat. The Malbec grape gives the wine a black colour, earning it the nickname ‘Black Wine’. Throughout the Lot there are 4,200 hectares of vineyards, mainly to the west of Cahors in the Lot Valley. The most important wine-producing places are Mercues, Parnac, Luzech, Prayssac, Grezels, Puy l’Eveque and Vire sur Lot. Some also produce white and rosé wines known as Vin de Pays du Lot. Listed among the most beautiful villages of France, and therefore one of the most popular tourist destinations in the Lot, the village is situated 20 kms east of Cahors and falls within the Causses du Quercy National Park. At the highest part of the village are the remains of the three fortresses, with views in both directions along the Lot Valley. Formerly an important regional centre within the historic Quercy region, Saint-Cirq-Lapopie is now home to numerous artists and artisans, and there are many small shops and boutiques in the centre. Known as the Vertical Village, Rocamadour overlooks the Alzou canyon and was built into the cliffside on various levels, so that its houses and churches appear to be part of the rock itself. 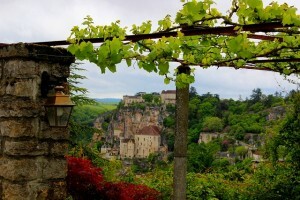 The village housed the relics of a famous hermit and was the sanctuary of the Black Virgin, and in the twelfth century pilgrims would travel to Rocamadour to pray. Located in the Célé valley to the east of the Causses de Quercy, Figeac is a substantial medieval town which was an important trade and commercial centre, with several large houses and palaces built for rich merchants. Figeac is also known as the birthplace of Francois Champollion (1790-1832), a scholar responsible for deciphering Egyptian hieroglyphics. The Museum of Ecriture, formerly his family home, explores writing across the centuries, and explains the decoding of the Rosetta Stone. Set in the Lot valley west of Cahors, this village has numerous medieval buildings and churches, spectacular views, the remains of town fortifications and a castle. Once home to four monasteries, Gourdon is a golden-coloured medieval hilltop town with a well-preserved centre with several churches and monuments. Situated in the north of the Lot, on the old trading route between Paris and Toulouse, Martel boasts seven large medieval towers and many merchants’ houses, with ornate doorways, mullioned windows and stone staircases. There is also the gothic church of Saint Maur, with a carving of the Last Judgement above its west door; La Tour Tournemire, a square tower which once served as a prison, and the remains of a 13th century Franciscan monastery. Souillac lies on the north-western edge of the Lot department, and its attractions include a 12th century abbey, several medieval buildings and a 19th century market hall. Le Gouffre de Padirac, just 8 km from Rocamadour, has over 400,000 visitors a year. A lift takes visitors down over 100m below ground level, where a boat trip through an underground river visits caves with a variety of rock formations, a Rain Lake known for its translucent water, the Grande Pendeloque stalactite and the Salle du Grand Dome, with its 94m high roof, which houses a multitude of crystalline formations. Les Grottes de Lacave are also near Rocamadour, and comprise an extensive layout of caves filled with stalactites and stalagmites. Le Grotte de Peche Merle near the village of Cabrerets is one of the major painted caves in France. It was discovered in 1922, and its seven caverns house crystalline formations stalactites and stalagmites and some 70 pre-historic paintings and engravings. Les Grottes de Cougnac, just outside Gourdon, were discovered between 1949-52, and include stalactites, stalagmites and a selection of prehistoric paintings. As well as its wine, the Lot is known for a variety of gastronomic produce, from truffles, to Rocamadour goat’s cheese, melons, lamb and saffron. 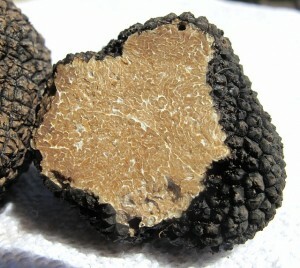 Truffle hunting is organised from December to March, with truffles available from the markets at Lalbenque on Tuesday afternoons and Limogne on Friday mornings. Rocamadour Goat’s Cheese is made from the unpasteurised milk of goats fed on the aromatic and varied vegetation of the Causses du Quercy. Widely available in restaurants throughout the Lot, it can be served hot or cold, either with honey or saffron syrup, made from the saffron that is also grown in the area. Returning Crusaders brought the Crocus Sativus to the Lot, and its saffron is harvested annually between October and November. Local chefs produce saffron sorbets and ice-creams, sweets, syrups and aperitifs. The lamb produced in the Lot is widely prized – the Caussenarde breed graze on the wild herbs of the Causse, producing a very high quality meat. Cultivated for almost a century in the Castelnau Montratier area of Quercy, the melon is one of the Lot’s flagship products, with a delicate honey flavour. 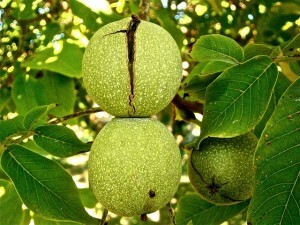 The Noix du Perigord, or Perigord Walnut, is another revered product of the Lot. Walnut groves line the banks of the Dordogne river, and local specialities include walnut cake, walnut oil, liqueurs, biscuits and sweets.